Hideaway Townhomes in Silverthorne Colorado real estate are a part of the quiet Eagles Nest residential community. 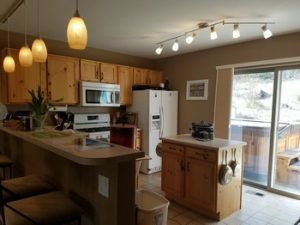 Minutes to the I-70 corridor, these Silverthorne townhomes offer a convenient location for a full time or second homeowner with nearby access to the Raven at Three Peaks golf course, shopping, the Silverthorne Recreation Center, world-class skiing, National Forest access for hiking, biking and more. Some of these Silverthorne townhomes are located right on the Raven Golf Course and some back to wooded aspen grove open space. Hideaway Townhomes offer open, sensible floorplans, private outdoor space in an incredible location. The Hideaway Townhomes consist of 78 privately owned residences that are housed within 15 separate buildings. All of these Silverthorne townhomes have private decks and most are outfitted with private hot tubs. These multi-level units offer a separation of space for families plus individual garages with enough space for storage and one large vehicle. To discuss your Silverthorne CO Real Estate search, inquire about a specific property or for local market data contact Justin and Krystal Knott with LIV Sotheby’s International Realty at 970.333.9050 or knott@sothebysrealty.com.